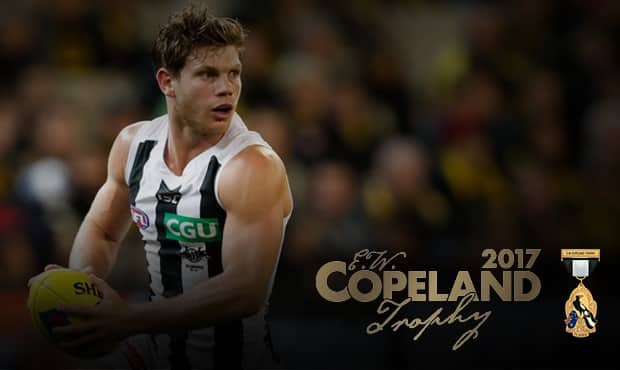 Taylor Adams has fallen one vote short of winning Collingwood’s prestigious Copeland Trophy. It was a case of two vice captains battling for first place through the final rounds of the count, with Adams finishing on 139 to Steele Sidebottom’s 140. Instead of taking home the main prize, Adams instead has his excellent season recognised with the R.T. Rush Trophy for second place. He shouldn’t be disappointed. By taking home the award, the 23-year-old joins Dane Swan, Scott Pendlebury and Adam Treloar as the only winners since 2010. Not bad company at all. For the first time in his career, Adams played all 22 home and away games in 2017. The durability allowed him to showcase a skillset based on toughness and grunt out of the middle of the ground, and an impressive ability to win the ball. Statistics tell a large part of the story. This season Adams led Collingwood in disposals (649), contested possessions (257), clearances (121), tackles (140) and score assists (140). However growth came in multiple ways as he grew as a leader on the field and inside the club on a day-to-day basis. Consistency was also evident as Adams polled votes from his coaches in 18 of his 22 games. Friday night is not the first time the former GWS Giant has accepted an award on Collingwood’s night of nights. In 2015 he won the Jock McHale Trophy for fourth-place in the Best and Fairest. Injuries restricted the midfielder to 14 games the next season, and a clear goal was set going forward. “I want to play as close to 20 to 22 consistent games of footy,” Adams said on the eve of round one. Mission accomplished, Taylor – the 2017 R.T. Rush Trophy winner. Along with his R.T. Rush Trophy for second place, Adams was also awarded a Tag Heuer Aquaracer 300M Calibre 16 Chronograph watch.